We seem to be on a bit of a Middle Eastern theme at the moment. I had a solitary whiting and a hungry Olwyn on her way back from Pilates so I thought why not add a quick starter to our chicken with pomegranate molasses? You can use Tarator Sauce for falafels as well. Nutty, lemony, garlicky, good. Here are the base ratios, add your garlic and salt as you like. OK if it helps I used a tablespoon for a scoop, with one garlic clove and half a teaspoon of salt. Just mix it all up. You can added chopped parsley if it looks a bit ordinary without. Put oil in a pan to 1 cm depth and heat until a lump of bread goes golden in 30 seconds. Mix the flour and seasonings. Dip the fish in the flour then straight into the oil for about a minute or until it looks cooked. 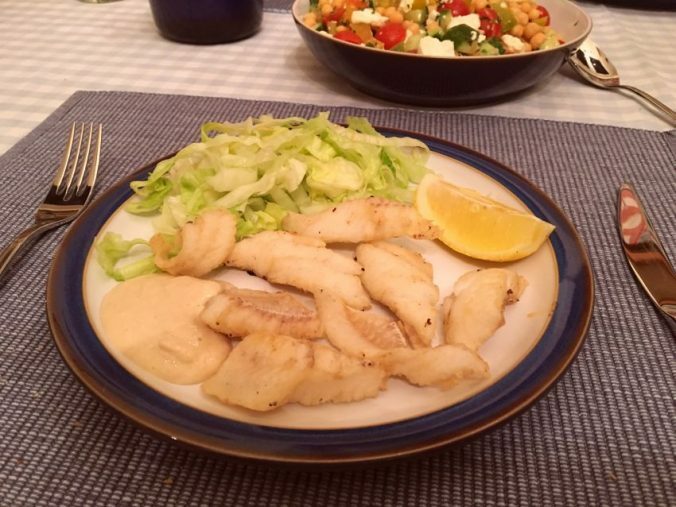 Serve with shredded lettuce, a lemon quarter and Tarator sauce.